Hong Kong is a fascinating fusion of the East and the West, combining the mystery of the Orient with the avant-garde vibe of the West. Its dramatic, jagged skyline, best seen from Victoria Peak or the harbor, is accentuated by the daily Symphony of Lights show by night. The city’s rich medley of cultures — British, Chinese, Cantonese, Jewish, Indian and Shanghainese — lends it a complex, exotic character. The city is known for its lively food scene – from Cantonese dim sum to extravagant high tea, and shopping, from the chaotic Temple Street Night Market to the city’s innumerable bespoke tailors. A tram ride up the impossibly steep Victoria Peak offers fascinating, aerial views of the cityscape. Walk down the famous Tsim Sha Tsui promenade past the colonial-era Clock Tower, to catch the pulse of enigmatic Hong Kong. Modern, chic and comfortable, Eaton Hotel is located in the heart of Hong Kong. 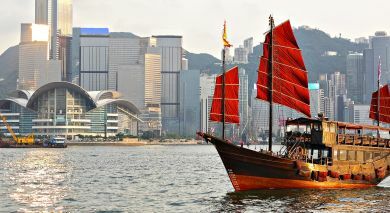 The hotel is in close proximity to the iconic Victoria Harbour and Hong Kong Convention and Exhibition Center. Merging with the iconic Hong Kong skyline, InterContinental Grand Stanford is located along the waterfront of Victoria Harbour. A luxurious destination, Kowloon Shangri-La Hotel is strategically located in the buzzing shopping and entertainment district of Tsim ShaTsui East. Enjoy Mandarin Oriental’s luxurious hospitality in the heart of Hong Kong. Set at an upmarket and swanky destination, Regal Airport Hotel is directly connected to the Hong Kong International Airport via a two-minute walk.